It all started when I noticed oil dripping out of the exhaust. One thing led to another and a quick top end rebuild mushroomed out of control. 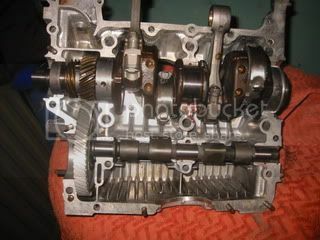 Crankcase align bored with drilled and tapped oil galleries. Crank journals polished, main bearing 0.50 x std. Conrods balanced and new small ends. 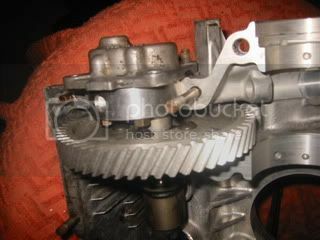 Crank, flywheel, clutch cover and fan dynamically balanced. Solid lifters with aluminium pushrods. Standard barrels honed, with match weighted pistons and new rings. All new bearings and seals. My trusty dellorto 40 drla carbs. I've built it to give a bit more performance than standard and all the balancing work will hopefully help with pickup and bit of mpg. The spec should give bags more torque and not compromise reliability (I hope). All the machine work and advice has come from Jim Calvert at Stateside tuning and he's been first class. Probably the hardest and longest job was rubbing down and re-spraying all the tinware, I stupidly managed to break my finger when I stripped the clutch so this and a lot of the engine build was done with one hand in plaster! The first start up saw oil leaking from the flywheel oil seal so it had to come back out, thankfully it ran well this afternoon. 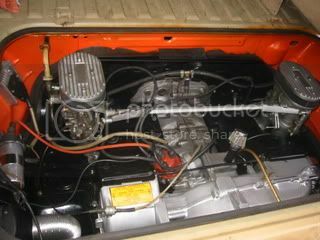 All I've got to do now is a few small jobs in the engine bay, run it in and go camping as much as poss! I've really missed driving the old girl. You've got to grind the oil pump bolts slightlyto clear the cam wheel bolts. Oil galleries tapped for cleaning, theres two more the other end. Finger out of plaster, some of my build was literally single handed! Cant wait to do more of this! thats really nice! i have the same type of motor to a simullar spec but the stock cam, where have you hooked up your vac advance/retard too to run the dellortos? looks superb! hows she driving? Vac advance goes to an anti pulse valve (recommended by Steve at Gasure) then on to carb. Retard has no hose but not blanked off. 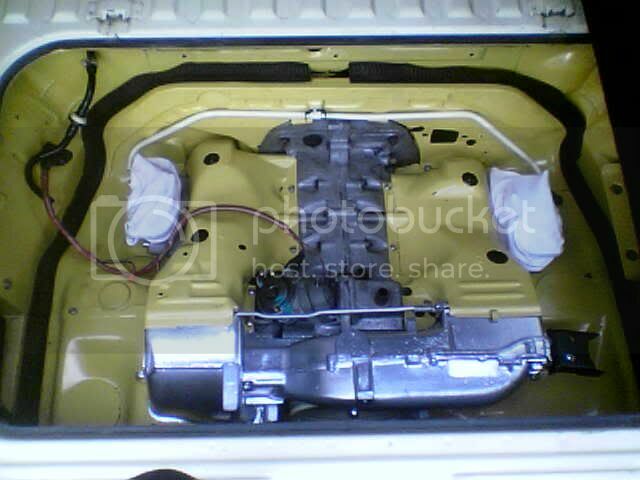 Jim Calvert suggested tapping the inlet manifold and attaching a pipe from there to the retard. I havent done this yet but I've run my dells for a year with the above spec and they've been excellent. I've only got the engine going again this afternoon so I'll report back when I've got a few miles under my belt. I going to give her a good long run tomorrow, I can't wait. The van looks good from about 30 feet away! I've rollered it and needs another coat of orange. The sliding door needs a repair section on the bottom, hopefully later this year. Funilly enough, a breather box is on my never ending list. La Performance do a sweet cylindrical one that would fit nice across the front tin. I'll google for ratsport though. I wasn't at Stamford hall, but I hope to do loads of trips this year, I'd planned to go to Vanwest this weekend but the van wasn't ready. 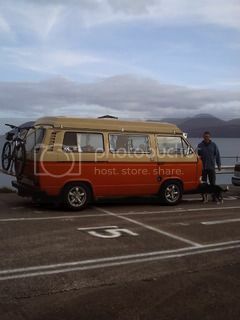 The pic was taken was taken waiting for the ferry to Arran last Autumn. Blood, sweat, numerous hospital visits and tears all worth it in the end mate! Can't wait to see it. I'll be over this week! that looks great . i bet it sounds fantastic. took my time at getting a pic of my motor so far gsmoke, hopefully i'll have my twin weber idf's fitted tomorrow & i'll try to get it up & running! mine is a stock 2.0 cu motor but it'll have a tubular manifold & more sporty better flowing exhaust, the heat-exchangers are gone! for heat i have a propex to fit & i'll t-piece a warm air feed from the propex to the screen! i know its a bit off topic but whats ya troubles murdock? the 2.0 cu is a reliable motor but the electrics on the motor are all old now! a rolling road tune-up is also well worth the cash if you suspect you have fueling issues! as i say i have to get mine up & running yet! :OD just doing things like changing all your spade end connecters for new ones & cleaning up all your electrical connections with sand paper makes a big differance! had the nearside head off for some exhaust stud replacement work, since putting it back on, the van now burns oil from that side. i have been under and checked for leaks and its all bone dry? stopping after even a short drive and it chuffs out smoke from around that head! the chap who did the work wont get anymore from me, complete "useless personage" in my eyes , spinning me yarns and making me wait weeks!! if he wasn't recommended by a mate, my actions would have been a lot different. i have another head in the garage that has the same exhaust stud issues, it needs helicoils or similar as a couple of the studs just fall out, need to find someone who knows what they are doing !! sounds like the valve guides are worn on that head! if you have a word with lee-clewley, i've used him for head studs on mine but i had to get stepped studs which i got from the good lads at mega-bug! lee did a good job! real pleasant chap i know he is'nt local to you but if you give him a buz & say short-a*** dave from coventry recommended him! he's not the biggest fan of doing our type 4 motors/heads but i'd defo ring him again to sort any head woes! if the stud holes in yours are big he may drill them to 10mm & use 10mm studding, then you drill you heat-exchangers to 10mm & bolt it in-job done! i'll give him a ring, cheers ! 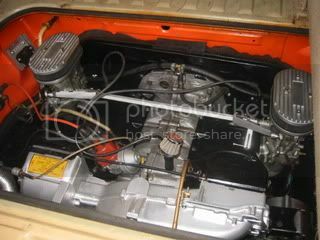 what carb linkage kit have you used gsmoke??? I bought the one sold by dellorto.co.uk. Its branded as empi but seems idendical to the csp one. Its been fine. How are you getting on with the webbers?